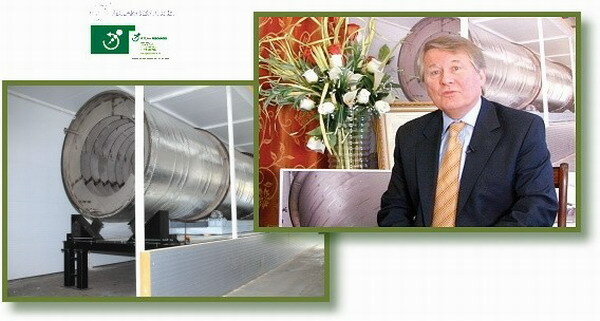 In December, Golden Year 5 (2008), Mr. Philip Hall, Director of Reclaim Resources, received the Shining World Inventor Award from Supreme Master Ching Hai for developing the Vantage Waste Processing system that recycles solid waste. The company, Reclaim Resources, is located in South England and was formed with the goal of inventing a system to treat municipal household waste. Its Vantage Waste Processing system takes household waste and transforms it into biomass ready for conversion into a range of resources, including electricity and bioethanol. It can reduce raw, unsorted garbage by up to 60% using thermal hydration to process and sanitize waste material through a continuous feed rotating stainless steel chamber. At less than one-tenth of the cost of incinerator plants, this system can be easily manufactured to be affordable to many. An Award ceremony was held at Reclaim Resources and Mr. Hall was delighted to receive the Award presented by our Association member. “At the end of the day we’re both trying to improve the way we live, our planet, and we in our own way have striven to do that and I think with the help of your channel we’ll increase it more,” he said. 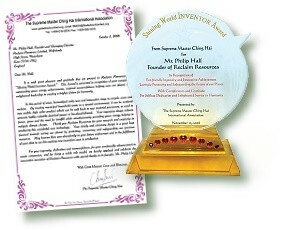 We applaud Reclaim Resources for its outstanding green innovation. May we continue to be blessed with the love and wisdom in finding ways to restore and enhance our precious planet.